George Berkeley (1685–1753) was the founder of modern idealism. Unlike his seventeenth century idealist predecessors, such as Nicolas Malebranche (1638–1715) or Gottfried Leibniz (1647–1716), he was not a rationalist. Berkeley was completely comfortable with science and empiricism in general, and he significantly weighs in with the great triumvirate of British empiricists: John Locke (1632–1704), George Berkeley (1685–1783), and David Hume (1711–1776). Berkeley was born in County Kilkenny in Ireland, where he went to Kilkenny College for four years, beginning at age 11. He then went to Trinity College in Dublin and was elected a fellow there in 1707, holding the position until 1724. His first book, An Essay Towards a New Theory of Vision, was published in 1709, followed by the Treatise Concerning the Principles of Human Knowledge in 1710. In 1713, he moved to London and published Three Dialogues between Hylas and Philonas, the first of his works to be well received. He was presented to Queen Anne by the renowned essayist and satirist Jonathan Swift (1667–1745) and became friends with the literary elite of that time. In 1724 Berkeley was appointed dean of Derry, which provided him financial security, but his dream was to found a Christian college in Bermuda that would admit “Negroes” and Indians, as well as white Americans. He raised money for the project, but not enough for it to become a reality. The British Parliament awarded him 20,000 pounds, but that money never came through. Berkeley married in 1728 and he and his wife, Anne, went to Rhode Island to set up farms to grow food for the prospective college. They remained there for three years, and then returned to live in London. He defended Christianity in The Minute Philosopher in 1732, and claimed that mathematics was more mysterious than religion in The Analyst in 1734. That same year, he became Bishop of Cloyne, which led him to move back to Ireland, where he remained until he died in 1753, while visiting his son at Oxford University. 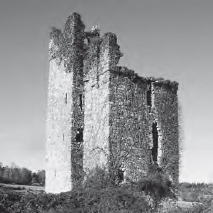 Dysart Castle in Thomasttown, County Kilkenny, Ireland, was the home of George Berkeley. (Art Archive).